A Fine Beginning is a Welsh photography collective, established by James O Jenkins with the ambition to develop a platform to discover and showcase contemporary photography being made in Wales today. A Fine Beginning, from which this collective takes its name, is the first chapter of Dylan Thomas’ unfinished novel Adventures in the Skin Trade. The central character of the story leaves his parents home in South Wales for Paddington Station and when asked where he’s going, Samuel Bennett replies, ‘I don’t know where I’m going, I haven’t any idea in the world, that’s why I came to London’. A Fine Beginning aims to offer a platform to photographers making work in Wales to have their photography seen and appreciated in Wales and beyond. (b. Gorseinon) is founder of A Fine Beginning and co-founder of Portrait Salon. He has exhibited at The Photographers Gallery, The Association of Photographers and Hotshoe Gallery. James works for a wide variety of clients and publications. In 2012 he published his first book ‘United Kingdom’, a visual study of traditional annual UK customs, which has been shown in London, Helsinki, Arles and New York. In 2013 his series ‘United Kingdom’ was featured at The Northern Gallery for Contemporary Art, where he is also currently showing work from Thatcher’s funeral in the exhibition ’Show Me The Money: The Image of Finance’. Sam Peat is a freelance photographer and recent graduate of the BA Documentary Photography course at the University of South Wales, Newport. Sam was published in the recent July edition of the British Journal of Photography and hopes to continue to work on assignment based projects for editorial magazines and newspapers, and long term documentary photography projects. In addition to documentary work, Sam also works as the Regimental Photographer for Wales Officer Training Regiment. Dan Wood, from Bridgend, discovered photography in 1996 through Skateboarding and the culture that surrounds it. Although versatile and predominantly self-taught, Dan considers himself a documentary photographer, as his main interest in life is to document what happens around him in the best way possible. Dan takes inspiration from a wide subject matter and has travelled widely in pursuit of photos, capturing a multitude of cultures and educating himself at the same time. “I’m always seeking to produce images that are expressive, empathetic and thought-provoking.” Dan’s work has been featured in many publications, and has taken part in over 35 exhibitions both nationally and internationally, including 3 solo shows. Ben Terzza (b. 1989, Nottingham) is a current attendant of the Open College Of Arts (UK). After completing a BSc in Science and travelling Europe he has established himself with a focus in Photography and visual documentary work. His work explores the individuals and society around him ; be it hypothetical references, iconography, products / services, food, media, and personal relationships with his surroundings. Ben is currently working on a experimental documentary of new age West - America and currently resides in Flint, north Wales. Harry Rose. With a keen interest in landscape photography and how this relates to memory and our own interior landscapes, Harry creates work within the Uk. Graduated from University of South Wales (Newport) in 2014, Harry's main focus is working as editor for Darwin Magazine. A self published Magazine which was founded by Harry and Ryan Grimley in 2012, which provides a platform for both established and unestablished photographers and writers. Alicia Bruce. Alicia Bruce’s award winning photographs have been presented on an international platform and won several artists’ residencies and bursaries. Her images have featured in national press including The Times, The Scotsman, and STV News, and are represented in several public and private collections including the National Galleries of Scotland photography collection. Her commercial portfolio features an impressive list of high profile clients including the National Galleries of Scotland and Cashback for Creativity. Paul Cabuts. Living in south Wales, Paul Cabuts works in the evolving field of documentary photography with a practice that is grounded in the Valleys of the region. The colourful, typological nature of his work celebrates contemporary manifestations of the culturally less dominant histories of the region, and explores notions of identity and place. His work has been exhibited at venues in the UK and beyond including the Australian Centre for Photography, Germany’s Treffpunkt Stuttgart and the UK’s Exposure Festival of Photography at Hereford. 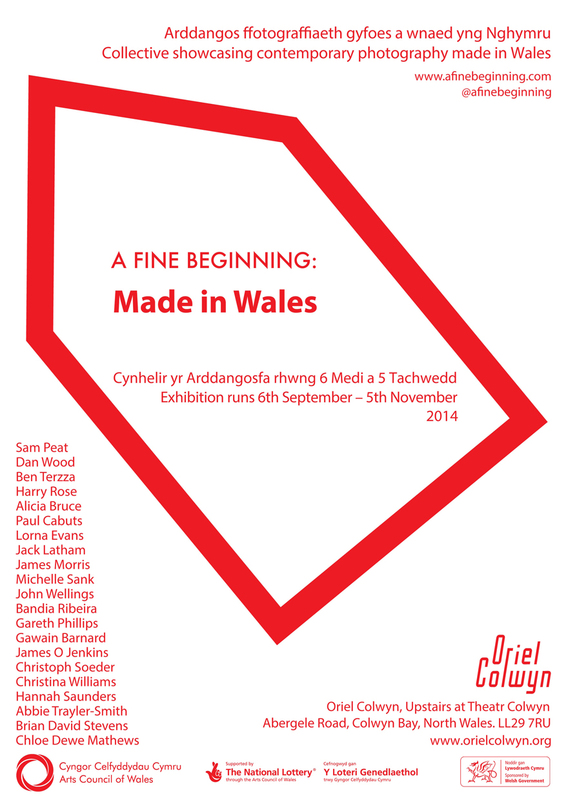 The Welsh dimension to Cabuts’ work has contributed to its growing visibility within Wales in exhibitions at a number of venues including Ffotogallery, the National Eisteddfod and the National Assembly for Wales. The work has also been published in catalogues, journals and other publications including Source, New Welsh Review, Taliesin and Planet and has featured on television both inside and outside Wales. Lorna Evans is a Welsh documentary photographer based in South East and South West Wales. The main focus of her photography and research is exploring animals, our relationships with them and the natural world. Lorna graduated with an MA and BA (hons) in Documentary Photography from the University of Wales, Newport. In 2013 her work was featured in Fresh Faced & Wild Eyed at The Photographers Gallery London. James Morris is a British photographer of landscape and the built environment. Known earlier in his career mainly for his architectural photographs, over the last decade he has looked more broadly at landscape issues from urbanism to human conflict and settlement. His work documents the impact of man’s intervention in the landscape and the layers of history evident there. In 2003 he published Butabu (Princeton Architectural Press), which records the threatened and vulnerable landscape of West African vernacular architecture. Seven years after returning to live in the country of his birth he published A Landscape of Wales (Dewi Lewis Publishing 2010) which has been described as both a love letter and deeply melancholic. His practice incorporates both self initiated and commissioned work – over the years he has illustrated many books and magazine features. He exhibits internationally and has received awards from the Design and Art Directors Guild, the Graham Foundation for Fine Arts, the European Union, the Arts Council of Wales, and the Welsh Books Council. His work is held in numerous collections including the British Council; Museum of African Art NY; Princeton University; Victoria and Albert Museum; Aga Khan Foundation; National Library of Wales: and the Welsh Assembly Government. John Wellings is an editorial, commercial and architectural photographer currently based in Swansea, South Wales. After studying at the documentary photography course at the University of Wales Newport, he went on to work as a freelance picture editor at the Financial Times while continuing to pursue his own photography. Currently enjoying a medium sized pace of life in South Wales which includes various outdoor related pursuits along with the usual social good times that a lower cost of living allows, John is currently working on personal projects and assignments for editorial and commercial clients. Bandia Ribeira was born in 1979 in a small industrial town in Galicia, Spain. After graduating in Politic Science she then started a Master in the Arts in Photojournalism in the University of Barcelona. Working as press photographer in a newspaper in Galicia and as a photography workshop facilitator in Barcelona she has also been working as assistant for a photographer (Agencia Lusa) in Portugal in 2011. Bandia moved to the UK in 2012 to start a BA in Documentary Photography in the University of South Wales. Bandia was awarded a scholarship from the Seminar of Photography and Journalism of Albarracin, Spain in 2010 and a Prize of Barcelona City Council. She received a FotoVisura Spotlight Grant honor mention in 2013 and has exhibited work in several venues in Spain, Germany and Wales. Gareth Phillips was born in Cardiff, Wales. He graduated from University of Wales, Newport, in September 2007, with a degree in Documentary Photography. In 2007 he was accepted into the Eddie Adams Workshop in New York, in which he won the B & H Assignment Award in recognition of his work. In 2008, Gareth became a freelance photographer and is regularly commissioned by the Guardian, The Sunday Times Magazine, Financial Times Magazine, Wall Street Journal and Economia Magazine. His photographs also appear in, Stern, British Journal for Photography, The Observer and The New Yorker Magazine. Gareth’s work has been internationally recognized in exhibitions and awards, most notably the Ian Parry Award 2007, Welsh Livery Society Award for Photographic Excellence 2007, the Magenta Photography Awards 2008 and the British Council Open Cities Photographic Commission 2010. Gareth is part of the MJR Photographic Collective based in New York and works out of London and Cardiff, UK. Christoph Soeder is presently studying Documentary Photography at the University of Wales, Newport. His commissioned work includes portraits, press coverage, reproduction of paintings and print layouts. Christina Williams was born in 1982 in West Wales, lived in Cardiff, Wales from 2003 - 2013 and now resides in Melbourne, Australia. Christina received an MFA in Documentary Photography (University of Wales, Newport 2012) and a BA in Media Production (Glamorgan, University Cardiff 2006). Hannah Saunders, b. 1993, is studying a BA HONS in Documentary Photography at Newport and is founding member of Origin Collective. Brian David Stevens, born 1970, is a photographer based in London UK. He has been published and exhibited worldwide. Chloe Dewe Mathews. After a degree in Fine Art at Oxford University, Chloe worked in the feature film industry for four years. Though exciting, she questioned its extravagance and wanted to work on something quieter, more economical, where there was room for spontaneity and intimacy with her subject. Since dedicating herself to photography, her subject matter has been diverse, from Uzbek gravediggers on the Caspian coast, to Hasidic Jews on holiday in Wales. In 2010 she hitchhiked from China back to Britain, which became a recce for a lifetime’s work ahead. Chloe has recently been awarded the BJP International Photography Award, the Julia Margaret Cameron New Talent Award and the Flash Forward Emerging Photographer’s Award by the Magenta Foundation. In 2011 she became the subject of a BBC Radio 4 documentary called Picturing Britain, which followed her long-term project on the banger racing sub-culture. Her work has been exhibited in London, Berlin, Buenos Aires and Toronto and published in magazines including The New York Times, the Saturday Telegraph, the Sunday Times, Huck, IL Italy, Dazed and Confused and Harpers Bazaar.